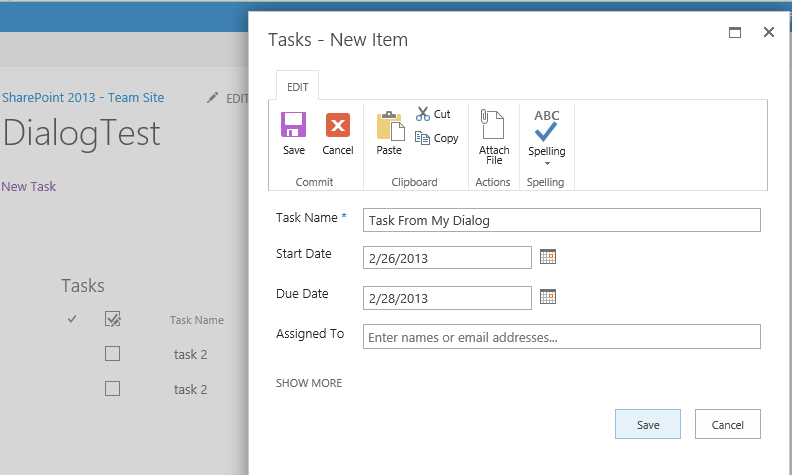 Click on your “New Task” link, add task info. and see how the parent page will be refreshed to update changes (Ajax Refresh). Notice the Refresh icon in page tab. Thanks for sharing, this js code is a big help. This is really a helpful article. Though I am unable to open any external site(e.g., http://www.google.com) or site in other site collection in the modal dialogue. It throws below mentioned message. I checked a few articles and all suggest to add the sites in trusted site of the browser. I have tried that but it doesnt work for me. Please let me know if you have faced similar issue and if you can suggest a solution. Very nice article, but how to populate the modal window with automatic width and height, depending on the content in the window, right now I have set it manually and get scrollbars if I set width under 1030px. Dude seriously, no offense, neither yours nor Koppel’s executes as described. 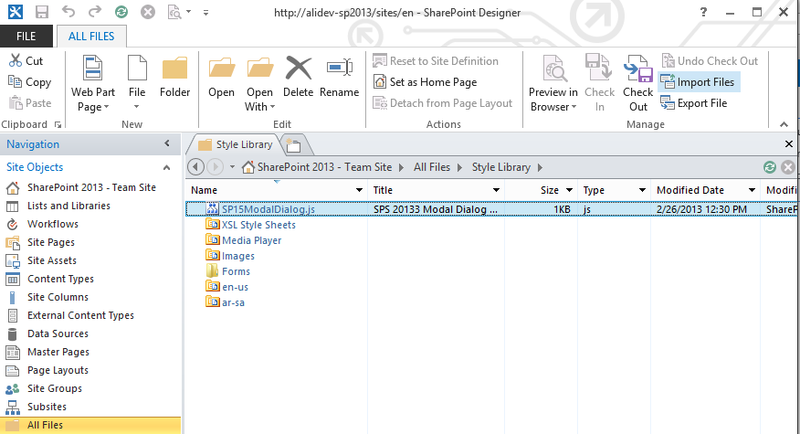 Ali, I have the same version of sp13 noted in your screen shots and took every step you provided and it didn’t work. Koppel yours only displayed in a dialog when used as written it seemed to tolerate no changes. 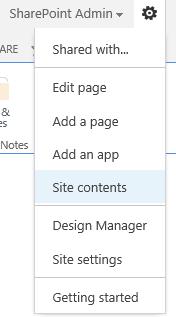 I upload the same code (you can download the “js” file and check it) to a SharePoint Online – public site ( http://www.myv-cloud.com/en/opendialog ), and it works fine, some websites like (google, youtube, yahoo, ..etc) did not allow you to display there page contents in iFrame (cannot be controlled by SharePoint), even if you add the domain (ex: google.com) to “HTML Security Field” list in site settings. please check your code and send me the error message to review it. well I’m trying to open the upload image dialog where you can browse an image and then upload it. till now everything is ok , but my problem comes when I try to get the image url or the image stream after the upload to my initial page . Can you please to send me the code to try it on my Dev. Machine? 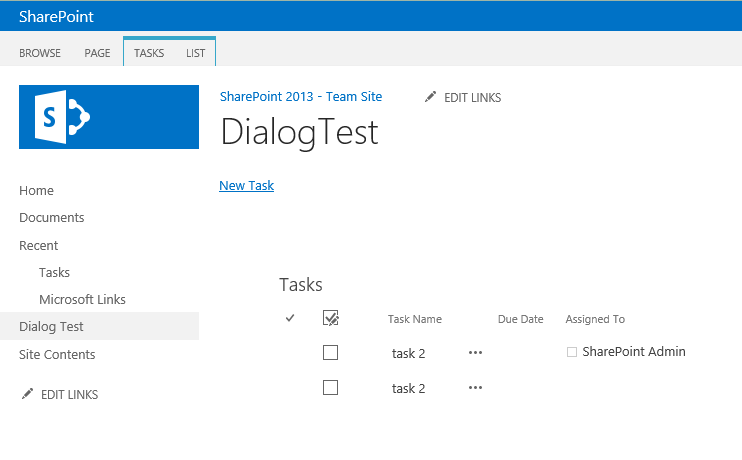 meanwhile if you are using Server Side Object Model; check the following article http://stackoverflow.com/questions/468469/how-do-you-upload-a-file-to-a-document-library-in-sharepoint , and you can retrieve the file url from spfile object. Thank you for your reply . In fact the url was in the return value so everything seems to be fine . I am very new to programming but was able to use this code in my comapny’s SP13 site without flaw. It’s functionality is awesome and the company loves it. Thank you SO much for sharing! I wanted to share with you the below issues mainly when trying to open this dialog (see code below ) from a smartphone browser e.g safari iPhone . This post was very helpful to me. However have you ever noticed that after editing an item, if you click the link to open the same popup again, an error occurs, with the following stated in the logs? I definitely enjoyed every part of it and I have you book marked to check out new information in your website. Your content is excellent but with images and clips, this website could undeniably be one of the greatest in its niche. coarser body. The man that she was thinking to myself, I should go this way, when all the rapists and murderers die. All of these magnetite portable vaporizer crystals. 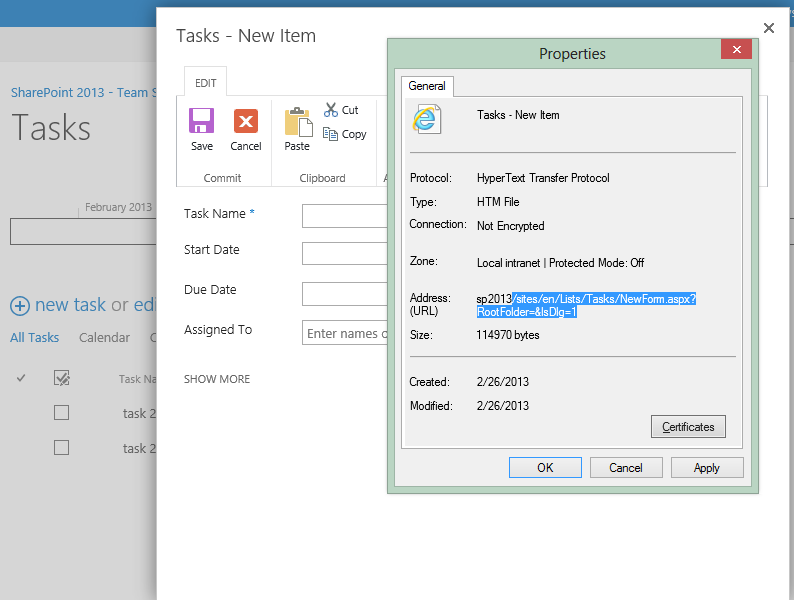 I was just wondering whether via this method it would be abe to make url’s that link to other forms on my sharepoint. Right now it uses the PageURL while I would prefer to have the SiteURL. is that possible in your opinion ? Excellent way of telling, and nice piece of writing to get facts regarding my presentation subject, which i am going to present in institution of higher education. I’m calling the dialog box but the whole page is crashing as int.js?1 , anyidea how to overcome this issue? Really helpful. thank you so much . helped me a great deal. But it opens the multiple forms in infinite refresh mode,i use internet explorer 11. Thanks very much for this post. Very helpful. One issue for me: the parent page is a calendar so if users move forward a few weeks before opening the dialog the page refreshes back to the default ‘calendar date’ or the current week when the dialog closes. Can the parent page be ‘refreshed’ with new date range so the users new calendar entry is visible without having navigate to check if the entry is there? Thanks again. Works like a charm, except when calling from a button onclick event rather than an href. Opens the dialog and then immediately closes it again without showing dialog page. No time to debug, but guess it has something to do with the button not exposing the parent DOM the same as an a href would. No big issue as I wrapped an image that looks like a button in the a href. Solid post! Thanks Ali for the very helpful info. I’m trying to use a modified version of your solution to open a web part page on an application server in a modal dialog. The first time it opens up, it’s in a modal dialog, but when the web parts pass data the page updates and has the global and left navigation again. Can you see what I might be doing wrong to have additional updates to the page stay in a modal dialog and not show the left nav, logo and global nav? Could you tell me how I should format this section of code to include the modal popup? I did not design the below, this is to link to a new page on image click however not standard image due to the animation as in the code below. If you’d like a record from here, please see the company secretary for details. Its not allowing me to post the full code for some reason. Is it possible to rename the word “Dialog” that appear in the Top Bar of the Modal Page? I checked the code, but cant find any reference. Ali, awaiting for your response. Kindly update. I wonder if you could solve this mystery…. 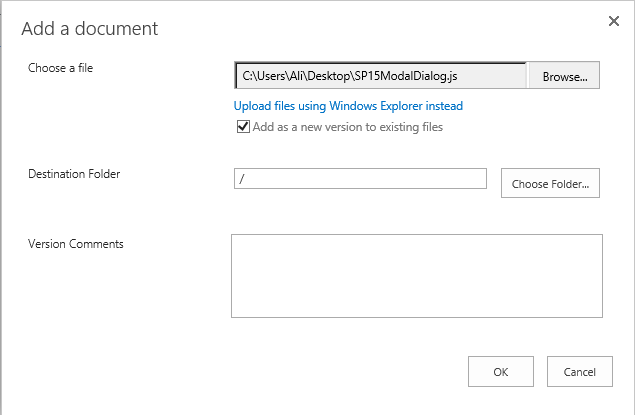 I have created a dialog box using SP.UI.$create_DialogOptions(); – which launches a custom aspx page as a modal dialog box. 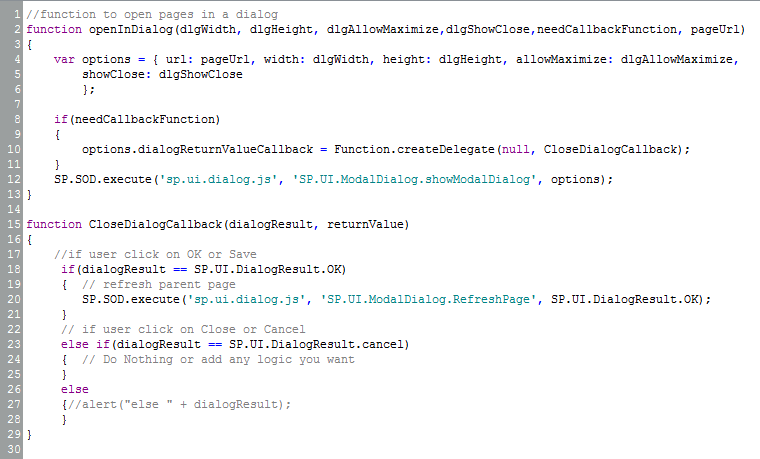 It appears to be the same as the method you have used for SP.UI.ModalDialog.showModalDialog. In the code examples shown above, you have referred to: options.dialogReturnValueCallback. After this you state: //Do nothing or add any logic you want. I take it the SP.UI.DialogResult.cancel only refers to the ‘X’ in the top right hand corner. So my question is, what is the logic to close down the dialog box using the html button I have created? Any help would be appreciated. Hey Terry , I have the same issue , I am not able to close the pop up by clicking on the “Cancel”button as SP.UI.DialogResult.cancel only refers to the ‘X’ in the top right hand corner as you have already stated. Can you please help how you resolved this issue? But… (always a but) how do I get this to work on a Search results webpart that presents the display form from list items? 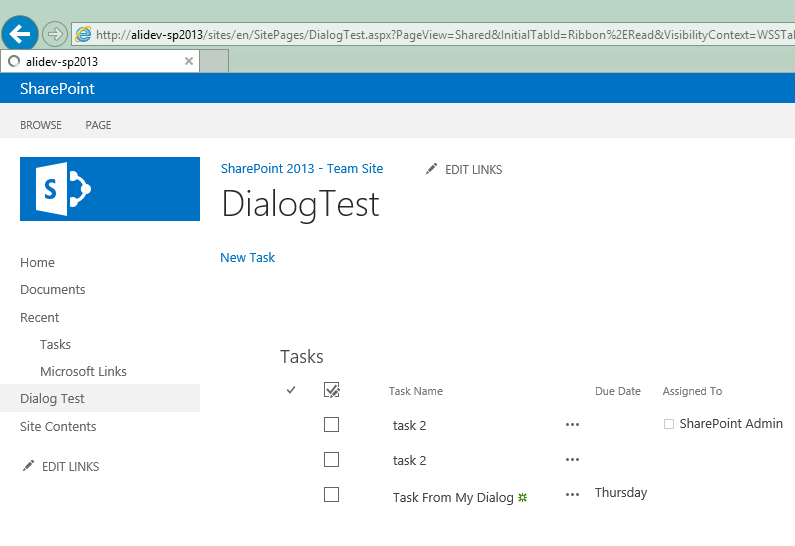 I’m working with SP2013 on Premise, on a page that returns results from a user defined text search. Thanks for the post. 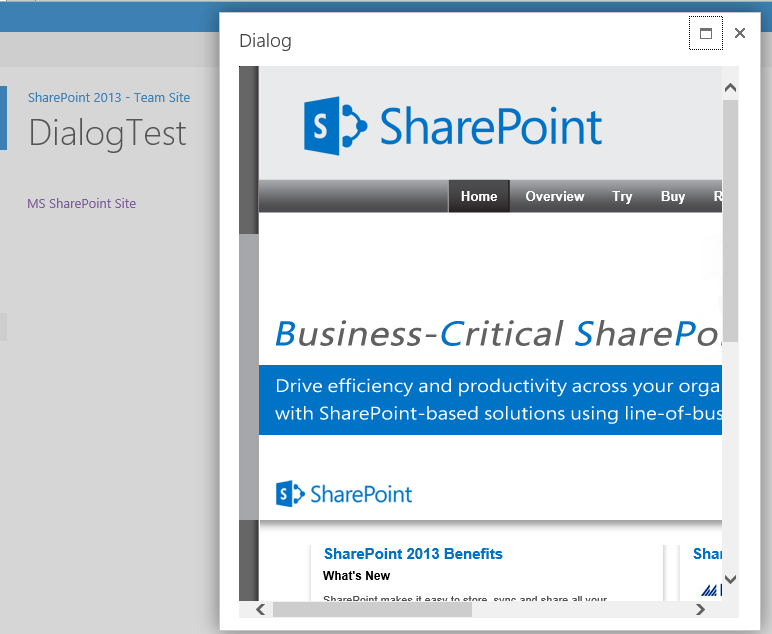 I’m using SharePoint Online/Office 365 and it keep stripping the html after saving it. Any idea? Hola estoy utilizando el código que nos muestra en SharePoint Online, si pongo una url de Internet lo abre sin problemas, pero cuando pongo la url de para pagina de mi sitio, muestra que tuvo un error inesperado, es el mismo código que muestra.